In the last two issues I discussed conditioning your dog to "hold" and did some basic lessons using ear pinch pressure. The last part of this series will explain how I use the electronic training collar to finish the force fetch conditioning. If you have taken your time and gone through the process step by step, the next part should proceed quickly and relatively easily. The dog must be collar conditioned before starting this process or you may have more problems rather than solutions to a problem. Using the e-collar makes it easier to reach out and touch your pup - just remember to only use the lowest level needed to bend the pup's will, not break it. The electronic collars today can be a great tool and when used properly are more humane than some of the old fashioned methods. Not every dog trainer should own a dog much less a powerful tool like the electronic collar. Use common sense and compassion with any training. 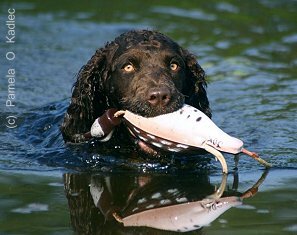 One of the major first lessons in using the electronic collar is to only use the collar for the conditioned retrieve until the entire process is complete. If you use the e-collar for "fetch" and "here" and "sit" and "kennel", how is the pup to know what you want? Do you want him to come to you, or go and fetch? Keep it simple and get through the entire conditioned retrieve process before using the collar for any other corrections. "Using the e-collar makes it easier to reach out and touch your pup - just remember to only use the lowest level needed to bend the pup's will, not break it." Refresh pup's memory by having him fetch each item off the bench. Give him a reminder ear pinch if he doesn’t comply. Once he shows he has understood all of the lessons so far by fetching everything without ear pressure reminders, then begin with the pvc dumbbell lying on the bench. This takes some manual dexterity on your part and good timing. Hook your hand through his collar and with the same hand, hold his ear ready to pinch if needed. With the other hand, set the e-collar on the lowest level needed to get pup's attention. Press the continuous button and pinch the ear at the same time. When the pup fetches say, "good fetch" and immediate let go of the button and the ear. Repeat until you only use the e-collar and not the ear pinch. Work your way through each object until pup will fetch each one without reminders. Use a nick if he hesitates and resort to continuous if he refuses to fetch. Sometimes you will have to step up to the next level of intensity in order to get pup to respond. If that happens, as soon as pup fetches drop back down to the lower level for the next fetch. The intent here is to bend the pup to obey, not to burn him to the point where he gets confused and anxious. Always start the next session where the last one left off giving pup a chance to have a positive start to the lesson. Once you have pup fetching everything off the bench, carrying and sitting to deliver it's time to move to the ground. If he spits out the object, immediately hold the continuous button and maintain pressure until the fetch is completed. If you started all of this on the ground, simply follow the above instructions before moving on. The advantage to the bench is two fold - the dog is elevated where he is less comfortable and you don’t have to bend over and strain your back. When I move to the ground, I don’t go all the way back to the pvc and wooden dowel. Put a check cord on pup. Start off with a bumper and have pup fetch out of your hand, then a walking fetch out of your hand, keeping pup moving and reaching for the bumper. Next, drop the bumper on the ground and press the continuous button at the same time you command the fetch. As soon as the pup runs to retrieve, let off the collar. If pup runs out and blinks the bumper (refuses to pick it up), immediately put on collar pressure to get the job done. Walk out with pup and encourage him to fetch using nicks on the collar at the same time you command the fetch. Take the check cord and have pup walk and carry the bumper back to the initial line, sit and deliver. As when you worked on the fetch with the ear pinch, take pup for a walk and condition the retrieve in different areas. Heel the dog, stop and toss a bumper a few yards. Nick him at the same time you cast him by his name, "back" or "fetch", whichever command you will use from now on. Start off with white bumpers until pup will race out to retrieve without e-collar pressure. Work pup in light cover to start so that you know he can see the bumper and has no excuses not to fetch. 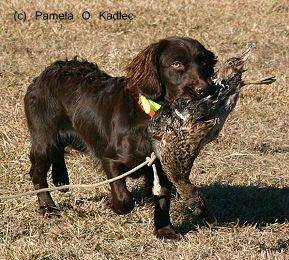 Move to moderate cover and if pup refuses to break the cover and find the bird, use nicks on the collar and command him to "find it" and "fetch it up". Read your dog to know how much pressure you can use. Some dogs work best with short nicks and others require continuous pressure. Sometimes I will send the dog on a continuous low level 2 and if needed, nick with a high 2 as a reminder of what to do. What if you have a dog that won’t leave between your legs when you apply e-collar pressure? This is not a sign that you are being too tough on the dog - some dogs are very soft and if they discover that between your legs is a safe place, you can’t get the lesson across. In these cases, I tie the dog’s check cord to a fence post and leave about three feet of slack. By using a fence, the pup is limited to how far and how many directions he can go. At first, give the pup an easy lesson by letting him fetch out of your hand. Next, drop the bumper on the ground and keep your hand nearby. Finally, drop the bumper and use continuous low-level e-collar pressure until pup will fetch. Take your time here and keep going back and forth between holding and dropping the bumper on the ground until pup gets the message. If this doesn’t work, use the combination of ear pinch and e-collar while saying, "fetch", then go back to only collar pressure. When pup will fetch off the ground without any pressure, it’s time to move back to the yard and away from the fence. Take pup on walks and work him with the bumper, toss it a few feet, then a few yards as pup gets the idea. Have an assistant throw bumpers and stretch pup out. If pup blinks them, immediately say, "no, fetch" and apply low-level e-collar pressure to make him go back and retrieve. Walk out with pup and alternate between continuous and short nicks (kick the bumper if needed) until pup makes the retrieve. This step is very important as pup needs to learn that no matter how far away from you he is, he still has to fetch. When pup will fetch in short cover, it’s time to move to moderate cover. Often, if pup can’t see the bumper he will blink it (run away without retrieving). You don’t want pup to ever quit on a hunt, so again, you will walk out and encourage pup to fetch, using the e-collar to make your point. Since each dog is different, you will have to experiment to see whether he responds best to continuous pressure or short nicks. Whichever method works best for your dog, always use the lowest level needed to get the job done. The next step is transferring this information to the water. Get on the shorts and be prepared to go in and force the fetch. If the dog has a strong retrieving and water drive this may not be an issue. Obviously, you don’t want to toss the bumper into deep water. Start off as if the dog is a young pup and toss it right at the water’s edge. Use e-collar pressure as needed if pup refuses. Remember to turn your collar down to a lower level on water. I found that most dogs respond to continuous when sending and as soon as the dog is in the water, let off the collar button. "Not every dog trainer should own a dog much less a powerful tool like the electronic collar. Use common sense and compassion with any training." If pup refuses once he gets to the bird, then use short nicks at the same time you say, "fetch". Repeat with the bumper going out a little further each time. Wade in with the pup if he seems confused. Have some extra bumpers so that if pup refuses and the water is too deep for you, an extra bumper can be tossed in closer to get the correction. Repeat until pup will fetch without assistance. When pup will fetch bumpers in any cover and any distance it’s time to take the final step and finish the condition retrieve with birds. This is the same as with the ear-pinch method: I found that with most spaniels - and other soft-tempered breeds - offering an "out" by easing the pressure often speeds up the process rather than slowing it down. If you toss a bumper followed by a bird and keep alternating between the two, pup can grasp the idea better than continually forcing the bird. Some dogs will push back and fight you until they finally shut down entirely and will refuse to do anything. Before this happens, give the pup a mental picture by letting him complete an easier task - fetching a bumper. Take pup for walking fetch lessons and alternate between birds, bumpers, and Dokken dead fowl trainers. 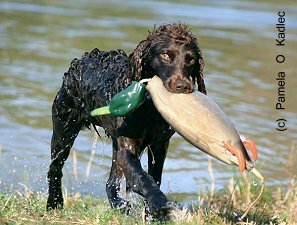 If pup will be used for different game birds, train with those birds - make sure pup will fetch ducks, dove, quail, pheasant, chukar and grouse... you get the idea. 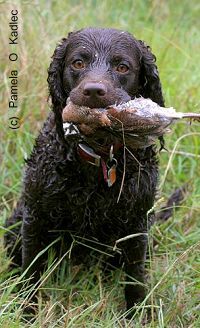 If you plan on running your pup in field trials or hunt tests, you will also need to train on old, smelly, nasty birds. While not fit for the table, sometimes ducks from the previous day's event are used the second day of testing. Be prepared. At the next session, work with birds in the water. Again, alternate between bumpers and birds until you can successfully get pup to fetch every bird, every time without any "reminders". Use a winger or get someone to throw for you so that you can stretch pup out to long retrieves. When pup will fetch on land and water, at any distance and in any cover, then the force fetch is almost complete. There will still be times when you will have to reinforce the fetch and you must be always prepared to do so. Remember the first part of this article? Now that pup is conditioned to retrieve using the e-collar you will need to re-steady pup. I recommend using a check cord initially to lesson the confusion. If you nick pup (or use continuous pressure) with the e-collar for breaking, he is going to run even faster to fetch the bumper! Think about it. Put yourself in your pup's skin before you press that button. Part One Hold That Bird! 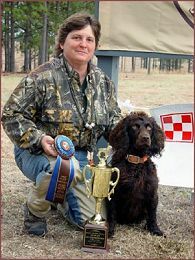 Pamela O. Kadlec is a professional trainer who specializes in training Boykin spaniels for both retriever and upland work. She owns and operates the Just Ducky Kennel & Spaniel Training Academy at Edgefield, South Carolina. For more on spaniel training, check out Pam's new book, Retriever Training for Spaniels, available through the Spaniel Journal Bookstore.